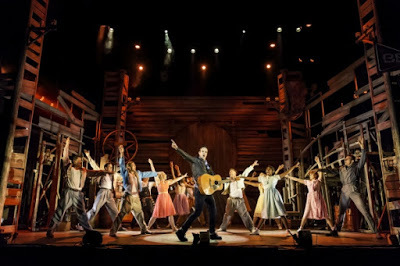 Well it's one for the money, two for the show, three to get ready now go cat go to the King's Theatre for Love me Tender this week. Just don't step on their blue suede shoes! 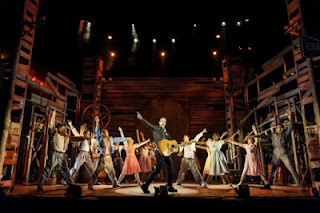 The newest jukebox musical on the block, Love Me Tender is packed to its perfectly formed quiff with Elvis Presley hits. Set in a small you never heard of it town somewhere in the midwest where the over-zealous mayor has pretty much banned fun, the town comes to life when Chad (Ben Lewis) roars into town on his motorcycle. The town are quickly All Shook Up and his arrival sparks an outbreak of love in the town with hilarious results. Lewis charms the audience with his swaggering performance of classic stud Chad while Laura Tebbutt is a delightful breath of fresh air as the lovesick, tomboy mechanic, Natalie. As geeky sidekick Dennis, it's hard not to root for Mark Anderson to get the girl. Mica Paris is underused as Sylvia but her incredible solos and superb vocal duel with Aretha Ayeh are worth the wait. Sian Reeves steals the show when repressed Mayor Matilda Hyde finally abandons her moral compass with a number that stuns the audience and certainly wouldn't meet the Mayor's decency rules! What makes this show truly stand out from the jukebox musical crowd is the irrepressible fun factor. The performance is infectiously joyous and teeters on the line of the ridiculous while keeping the audience guessing on who is going to end up with who in the end. One Night With You will never sound the same! Whether you're an Elvis fan or not there's fun enough to go round so it's time for a little less conversation from us and a little more action (go to the box office!) from you.